in the region of Braj. came face to face with the Dark One. -- Come get the Dark One, the Dark One! The "Dark One" referred to in Mirabai's poetry is Krishna, whose name can be loosely translated as the dark one. In this poem, milk is the ambrosial drink, the sweet subtle liquid-like substance often perceived during states of sacred ecstasy. Mirabai herself is the "milking girl going her rounds." 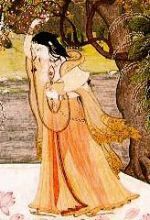 She is the mystic gathering the blissful substance of divine union, traveling town to town as a mendicant ascetic, with her awareness making the pilgrimage through the psycho-spiritual centers of the spiritual body (Vrindavan forest, where the Enchanter of Hearts is found). The milk pot is "on her head" -- a reference to the skull as the bowl that catches the fountain of the rising Kundalini Shakti and the descending heavenly liquid. When the ecstasy of spiritual union is strong, it is sometimes associated with an outpouring of words -- one more reason so many mystics become "babbling" poets. Her skull, the "pot," is full of Shyam -- Krishna, God -- and from this overflowing cup of divine milk, she is eager to share with all.